The Renaissance was one of the greatest periods of achievement in human history. The arts flourished, and we have countless masterpieces of panting, fresco, sculpture, and architecture that continue to awe us with their wonder and beauty. However, there is one element from these years of humanism and rebirth that has been largely absent – drawing. The Art Institute of Chicago highlights these largely unknown works with their exhibit, “Capturing the Sublime: Italian Drawings of the Renaissance and Baroque.” The show features 165 works on paper from Renaissance, Mannerist, and Baroque artists, drawn from the private collection of Anne Searle Bent. The lofty goal of the exhibit is to highlight the artistic processes of these artists, allowing us to share in that moment of inspiration. Giovanni Benedetto Castiglione, The Creation of Adam, c. 1642. Gift of an anonymous donor; restricted gifts of Dr. William D. and Sara R. Shorey and Mr. and Mrs. George B. Young. Image courtesy of the Art Institute of Chicago. The spark of creation is clearly present, and these works contain an almost frenetic sense of energy and discovery. Looking at these drawings, one can almost imagine the artist at work, and feel their pride in giving their ideas form and substance with a few carefully placed strokes of ink, pastel, or gouache. While their aesthetic qualities may capture our imagination now, it is important to understand that in the time these images were made, drawings served a primarily utilitarian purpose. The exhibition highlights the many uses of the medium: botanical observations, anatomical studies, preparatory sketches, copies of artworks by famous artists (highly prized in a time without mass reproduction of images), theatrical set designs, and modello, large presentation drawings meant to give patrons a sense of what their commissioned works would look like when completed. Just as these drawings served a variety of purposes, they also highlight a variety of styles. Giovanni Battista Gaulli’s preparatory sketch of Madonna in Glory with Saints could almost pass for a painting on its own; the figures come to life with careful modeling in layers of ink wash. The stark contrast in Giovanni Bendetto Castiglone’s “dark wash” prints, made with white highlights on mostly black backgrounds, gives his subjects an almost divine glow. Gherardo Cibo’s studies from nature echo Leonardo in their almost scientific level of detail. There are a few pieces from more recognizable names as well, including: a rare work from Correggio, a sketch that exemplifies Jacopo de Pontormo’s fondness for unique compositions, a portrait of a young man by Bronzino, and small Madonna study by Raphael. 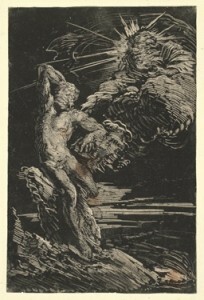 “Capturing the Sublime” offers a unique opportunity – by studying these images, we are able to look over the artist’s shoulder at the moment of creation. It is a thrilling experience, so don’t miss your chance to see these rare works before they disappear once more into private collections. “Capturing the Sublime” will be on display through July 8. For museum hours and tickets, click here.